I am elated to give a wonderful update today. Praise be to God!!! Connie and I went to Ann Arbor for three different doctor appointments yesterday. We met with the surgeon who performed the liver resection, a genetics specialist, and my oncologist. The surgeon was very pleased that healing is progressing very well. He recommended continued rest when tired, moderate exercise, and to see my oncologist for subsequent treatment as soon as possible. I asked him if meeting my oncologist in a few hours was acceptable and he smiled with approval. The genetics specialist reviewed my case to see if there might be a genetic explanation for having two cancers before the age of 50. While I tested negative for the most common genetic explanation for cancer susceptibility the oncologist ordered a long-shot follow-up test for another known condition. She also explained that there may be unknown genetic causes that they simply have not yet learned about and assurred me that there was an army of researchers hard at work, looking for new insights into cancer causes. I agreed to participate in research and I pray that this team will find causes that lead to cures!!! The Oncologist had the best news of all. My CEA level tested as 1.1. This is the very lowest level since starting tests over a year ago. 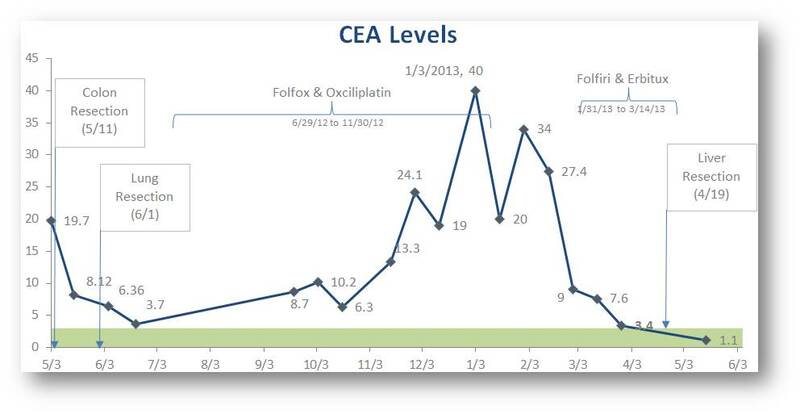 More importantly, the green strip on the bottom of the graphic below represents the normal range for CEA levels. As you can see this is the FIRST TIME my CEA level has fallen within the normal range! Yah!!! I was prepared for the oncologist to start the remaining chemo treatments immediately; however, I was pleasantly surprised that the good doctor said it was fine to extend my break from chemo a few more weeks. Therefore I will not start chemo until Thursday June 6. That means I will remain chemo free (and free from the side-effects) through Memorial Day weekend and through the June 1st Colon Cancer Awareness 5K Run/Walk! I am really looking forward to seeing many of you at this important fundraiser. I will be very proud to walk with all of you for this cause! May God continue to bless and keep you all as we begin this warmer season!